There are two kinds of green. At Long Beach, the commitment to environmental progress remains at the forefront of the port’s business plan. That’s just smart business. A March 2017 visit to the Port of Long Beach provided a close-up view of one of America’s premier seaports. 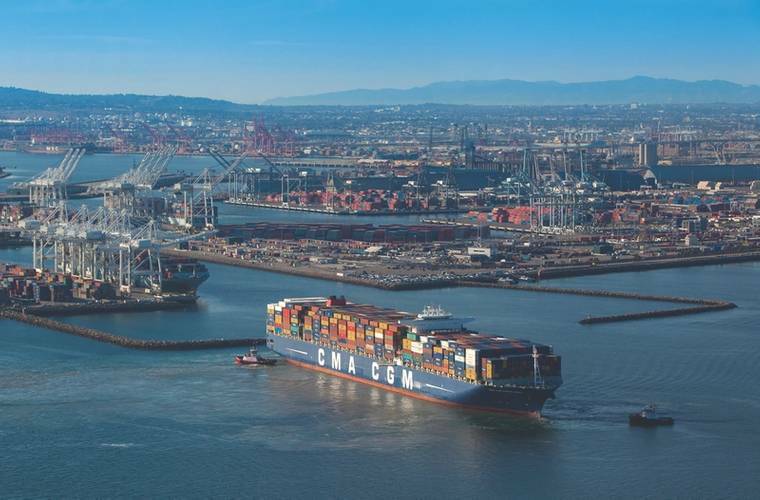 Most stakeholders already know that the port is a major gateway for containerized traffic and a host of other goods and commodities on the U.S. West Coast. That’s not news. Neither is the fact that $180 billion in total trade annually moves through the nation’s second-busiest seaport. The bigger story, it became clear during a two-day tour and executive interview with interim Chief Executive, Duane L. Kenagy, P.E., is how all of that gets accomplished in the same space that is spending $4 billion in infrastructure upgrades while also providing leadership in the all-important area of environmental stewardship. The Port of Long Beach bills itself simply as ‘the green port.’ And, interim Chief Executive Kenagy told MLPro from the outset, “Our commitment to environmental progress remains at the forefront of our thinking.” All other efforts and initiatives follow and stem from this baseline, says Kenagy. Eventually, the port’s long term success depends on it. An accomplished engineer with deep roots in maritime infrastructure planning, the port’s chief executive likes the other kind of green just as much. He also knows that without securing the first part, the second won’t be possible. The port is the primary economic engine for both the city and the region, supporting more than 30,000 local jobs, 316,000 jobs throughout Southern California and 1.4 million jobs throughout the United States. It generates about $16 billion in annual trade-related wages statewide. A port staff of over 500 people with an annual budget of nearly $900 million receives no direct taxpayer funding. It all sounds good. And, it is probably tempting for local officials to sit back, enjoy the many benefits that the port provides and simply wait for the cargo to arrive. But, that’s hardly the plan, and Kenagy, who previously served as the Port’s Capital Program Senior Executive Lead, now finds himself overseeing the Port’s decade-long, $4 billion+ capital development program – the largest infrastructure investment of any port in the nation. The landmark projects include the replacement of the Gerald Desmond Bridge. Kenagy explains why. “From an engineer’s perspective, that’s a functionally obsolete bridge – it is safe but it is narrow and 15 percent of all containerized cargo goes over that bridge every day, so it’s a vital connection for the U.S. transportation system.” This year, the port budget for capital improvements is about $500 million. Some projects can take up to a decade to complete, especially when considering the planning process, permitting and eventually, the construction. Other major projects include the Middle Harbor terminal redevelopment project ($1.3 billion), various dredging projects, and a rail project that, over ten years, will eventually benefit the overall efficiencies of port complex. The capital projects are not without purpose. The port isn’t at maximum capacity yet, but the ‘baywide’ (LA/LB) combined forecasts for future growth call for a doubling of TEU throughput to about 32 million TEU’s by 2035. Getting there is important. How the port does it, says Kenagy, is far more critical. They don’t call it ‘the green port’ lightly. With a Green Port Policy that calls for maximum effort to minimize or eliminate negative environmental impacts, the Port has also developed a reputation as a pacesetter for innovative environmental programs. For example, the Port of Long Beach pioneered such programs as the Green Flag vessel speed reduction air quality program, Green Leases with environmental covenants and the San Pedro Bay Ports Clean Air Action Plan. 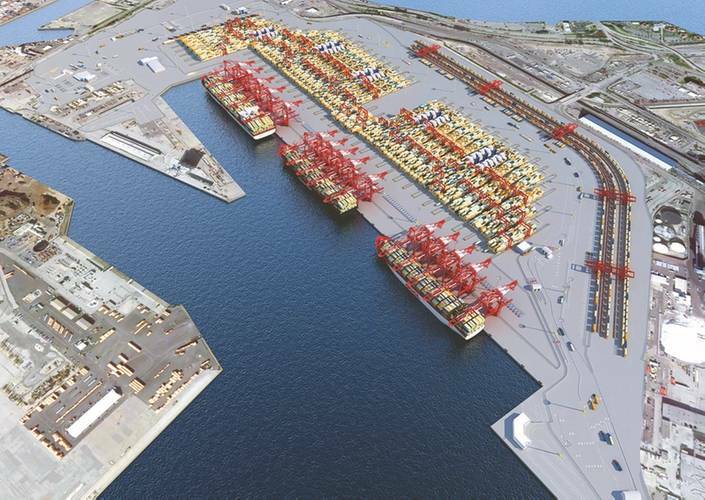 The Port also moved aggressively to outfit container terminals with shore power. Shore power allows docked ships to plug into the land-based power grid, instead of burning diesel fuel to run their auxiliary engines. Today, at least one berth at every container terminal has shore power. By 2020, all container berths will have shore power. The effort to clean up the air isn’t done in a vacuum; nor does it just involve the port itself. 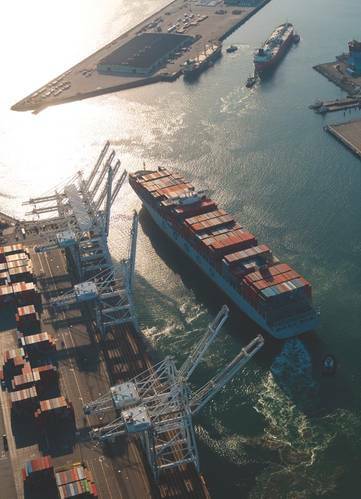 Notably, Maersk Line and the ports of Long Beach and Los Angeles are partnering to measure the environmental benefits of a $125 million upgrade for 12 boxships. High-tech equipment will track vessel emissions and energy efficiency over the next three years, with the ultimate goal of reducing the environmental impact of vessels calling at the San Pedro Bay port complex. The effort, of course, also requires the other kind of green. A combined contribution of $1 million from both ports helped to fund the project, one which has been hailed as unprecedented in its scope and scale. Separately, years of efforts to reduce environmental impacts related to goods movement have resulted in a flourishing ecosystem for fish and marine mammals, according to a new report on the water and habitat quality of Long Beach and Los Angeles harbors. The survey identified 558 species of plants and animals living on the rocks and pilings in the harbors. This represents a 60 percent increase from the last survey in 2008. These initiatives, which include the ship plug-in programs and other efforts to improve water quality, have paid handsome rewards. Kenagy points to the biological diversity that has grown over time in the harbor. In 2000, for example, there were only 27 acres of Kelp in the harbor and in 2013; that figure had expanded substantially to 132 acres. “We’re also seeing a dramatic increase in the number of species and wildlife that we find in and around the inner harbor areas. It’s great to see that wildlife return to these environments. So we’ve made great progress even in mundane things like traps in our storm drains that trap sediments,” added Kenagy. 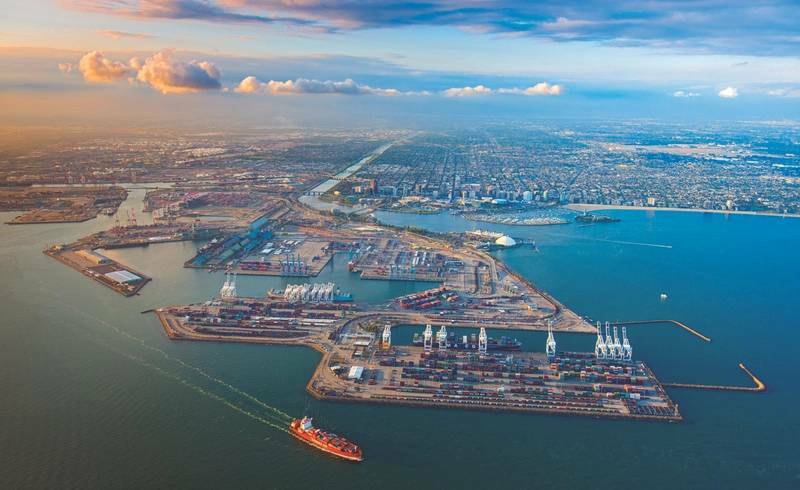 The Port of Long Beach’s success stands on its own, but at the same time, you can’t mention Long Beach without giving a nod to its next door neighbor and competitive rival, the Port of Los Angeles. Each a powerful force in its own right, both ports, with their economic and intermodal might combine to form the basis for the most formidable one-two maritime punch in the nation. That sort of relationship necessarily requires collaboration in some areas, even as both warily look to the changing landscape of liner shipping alliances in a post-Hanjin world, while trying to secure the largest possible share of that intermodal traffic. The collaboration runs deeper, even into business processes. In terms of supply chain optimization, both ports try to find out where a public port can drive more efficiency to benefit the overall system. And then, there are security issues for two of the most important ports in North America, operating in an edgy, perilous post-9/11 world. Close cooperation there ensures the safety of the massive freight gateway and the millions of people living in close proximity to the port(s). One such cooperative project, now completed, was the all-important Alameda Corridor, a 20-mile-long rail cargo expressway linking the ports of Long Beach and Los Angeles to the transcontinental rail network near downtown Los Angeles. The series of bridges, underpasses and overpasses separate freight trains from street traffic and passenger trains, eventually facilitating a more efficient transportation network. The port is in the early stages of investigating the feasibility of inland FTZ sites – much like what the port of Charleston, South Carolina is setting up. With any operation like that, there’s always a lot of environmental and community considerations. That said; Kenagy says that “everyone agrees that moving rail out of the port is good for the region but there are a lot of challenges to overcome from the economic and environmental sides to make that happen.” A renewed interest by the railroads in this kind of a concept could be the key. Investigated very thoroughly as far back as 2004, the economics just didn’t pencil out and so, it did not move forward. Today, it is closer to feasibility and that’s got to do with trucking rates and the fact that the railroads are more interested in new business opportunities than perhaps they were, 14 years ago. Everyone wants that ‘green.’ At the Port of Long Beach, the logo that touts ‘the green port’ has more than one meaning. Duane Kenagy will tell you that the port’s environmental efforts are at the forefront of every decision. And, that may well be true. At the same time, he and his colleagues have found a way to transfer that green footprint into a fatter bottom line. Not too many other businesses can make that claim, and at the same time, it is nothing to be ashamed of. Looking ahead, the port’s new executive office building is taking shape nearer to downtown and the port. The project, another P3 (public private) initiative is naturally a Leeds Gold designed and certified space. By the end of 2019, the entire management team will move to that location. 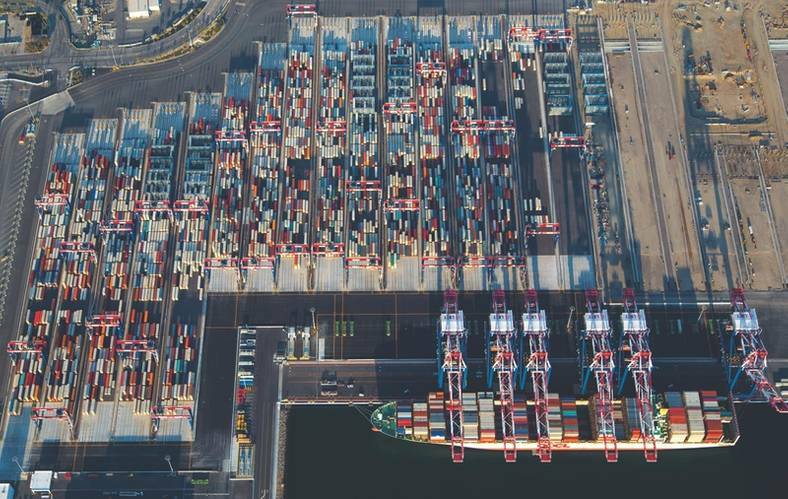 At a time when the regulatory machine is placing extraordinary pressures on the already struggling maritime space, the Port of Long Beach blends both sides of the equation into one shade of green. That might leave a lesser port, ‘Green’ with envy. 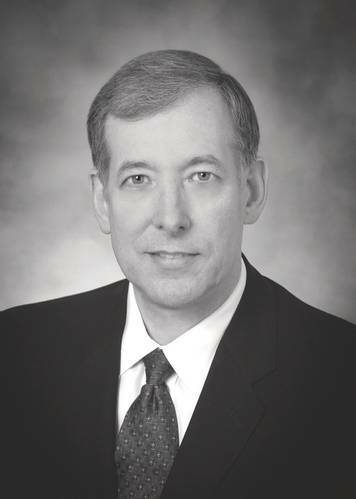 Note: In the time since this story was originally published in the March/April edition of MLP, Duane Kenagy has been appointed deputy executive director at the Port of Long Beach.